At BiryaniZ our mission is to offer the most authentic and flavorful Hyderabadi biryanis and other cuisine that are fit for the kings, our valued customers. We strive hard to perfect each recipe to make it unique in taste and flavor. We have the best traditional Hyderabad Dum Biryani in Chicken, Mutton and Vegetarian and our famous Vijayawada Dum Biryanis in Chicken, Paneer, Mutton,Fish ,Egg and Shrimp flavors . Do you know ? We are the creators of the famous Vijayawada Biryanis which is now widely available through out bay area with different names. We are confident that nothing can be matched to "THE ORIGINAL"
Why don’t you give us a try and taste for yourself? We have a unique recipe specially formulated by our master chef from Hyderabad and we are committed to bring in the exquisite taste of Hyderabad. We do not compromise on the quality of ingredients used in our biryanis or take short cuts, as we are passionate about serving authentic Hyderabad Dum Biryani to our customers. 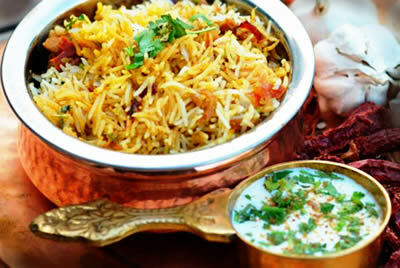 At BiryaniZ, each biryani is prepared carefully under constant supervision. This attention to meticulous details is especially important as we want our customers to enjoy, not just good but the best biryanis that are cooked perfectly. You can now enjoy our authentic biryanis in the comforts of your home! We deliver our biryaniZ by tray at your doorstep in and around Milpitas. We also cater for parties, office meetings, corporate events, family dinners, weddings and other occasions all over the Bay Area. Make your celebrations come alive with an authentic taste of indulgence. Please visit us during our business hours or call us for more information or check our website to know the menu options, receive price quotes and order online.